Of course, every Christmas is a Mercy Christmas. But during this Jubilee Year, it’s good to ponder the connection between Christmas and God’s Infinite Mercy. No matter how many Christmases I already have celebrated, I admit that I still cannot even begin to fully wrap my brain around a God Who Gifts us His Infinite, All-Powerful Self as a truly helpless Infant. Praise God for His Infinite Mercy. Gratitude and thanks, too, to the teenage girl, Our Blessed Mother Mary, who said “Yes” to God and gave Our Savior His Humanity–in an amazing mystery in which He remains just One Divine Person with two natures–the nature of God and the nature of man. Mind-boggling! This is a good point in this post, I think, to refer to the gift of Faith. To “simply” believe what seems impossible to understand, what seems too good to be true, and to humbly accept the Greatest Gift our God has given us–His Divine Son made flesh to save us! Holly Mueller, our year-round generous Spiritual Journey Thursday hostess, has shared a beautiful post in that regard, connecting faith with the Greatest Gift that Christmas–that the Christ Child–is! With many thanks to Holly for her weekly service, please accept this invitation to enjoy her post and to share one of your own. Holly does a beautiful job of connecting invitations, faith, and Christ’s Birth. Gift yourself this Christmas by reading her post! 4 Responses to Merry MERCY Christmas! Bobbie, thank you for reminding me that this year is one of mercy and that Mary was a young girl who said YES to God’s gift. It reminds me to be mindful of His Voice in my life. Peace to you and your family. Thank you for your beautiful reflection! God bless you! Hope you had a wonderful family Christmas! “A God who became so small could only be mercy and love.” So, so true! Thank you, Bobbie, for your sweet words. 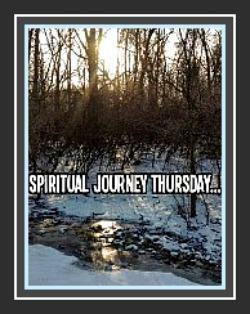 I love that you are part of the Spiritual Journey Thursday community! Merry Christmas! Thank you for your affirming comments. SJT truly is a gift of mercy and love from God; I am so very grateful for your gracious acceptance of my participation! 2015 will be memorable for Hus gift and yours! God bless you. Thank you!